Normally, you know a name and you want contact information, but in some cases you have contact information and need a name. Maybe you found a scrap of paper with a phone number on it, and can't remember who it was for. Or you may have someone's street address or email, but no name to connect to that info. In some cases a reverse lookup is easy and free, but sometimes it will cost you money. I always like to start with free, so try a search with Google, Bing, or your favorite search engine first. A web page containing a phone number, email address, or street address may bear the owner's name as well. 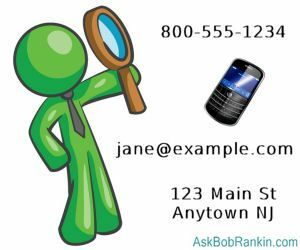 Put the search string in quotes to avoid results with parts of the string scattered all over the page, i.e., "720-555-1111" or "123 Main St Anytown NJ". If you don't get any useful results, try it without the quotes. Enter an email address in Facebook's directory search page. With about a billion million members, you have a good chance of getting lucky. You don't even have to be a Facebook member to search. The White Pages Reverse Phone directory will give you the name of the person associated with a landline phone. If you have a street address, try the White Pages Reverse Address Lookup. It can tell you the names of people or businesses associated with an address. Here's a cool feature… enter just the street name (omitting the street number) and WhitePages will tell you everyone who lives on that street! Note that the White Pages site also has numerous tabs and links for other types of searches. But most of those require a fee or subscription to a third-party reverse directory search company. Cell phone lookups are difficult, because the mobile phone providers do not make this information public. But here's a sneaky method that sometimes works. To find the owner of a cell (or landline) phone, try Spy Dialer. It calls the number you enter, but it doesn't let the owner know you called. It then records their voice mail message and plays it back for you. If the person has an outgoing message like "Hi this is Joe Sixpack, I can't take your call right now..." then it's likely you've found the owner. Finding the location of a mobile number's owner is more difficult, due to number portability and other factors. If you already know the name or the person or business you're researching, see my article Free People Search Tools for more tools to help you find them. MelissaData is a company that specializes in address verification software and services. Although their primary market is direct mailers who use the U.S. Postal service, you can use their Address Verify Lookup page to learn some interesting tidbits about a given address. Plug in a street address, and it will tell you whether it's residential or business, the associated telephone area code, time zone, congressional district, and school district. If you're a paid subscriber, you can also get the property owner's name, the assessed value, square footage, and data concerning the mortgage and real estate taxes. Google Image Search and Tineye use search-engine and image recognition technologies to locate online images similar to the one you provide. Both can (sometimes) find web pages that bear the image of a person you are seeking. It's an imperfect technology, but the service is free. Are Paid Reverse Search Tools Reliable? Reverse cell phone number searches are offered by many sites, with the promise of free results. Typically, a site will search for a phone number and tell you if it found a matching name. Then you're asked to pay $5 to $25 to get the name. See my related article Reverse Mobile Phone Number Lookup for more info on mobile phone lookups. Reverse email searches work much like reverse phone number searches. But again, always try Googling the number or address first. Is it worth paying the fee? That's a gamble. I looked up a street address at which I have not lived for over 20 years at Spokeo.com - and yet there I was, it said. EmailFinder.com runs this disclaimer at the bottom of its subscription page: "Available information varies by email address. Access to Email Finder does not guarantee you will find all details about an address." In short, you may very well pay for outdated, worthless information. Read all of the fine print to see if there is a money-back guarantee should your search prove unfruitful. You may have to give up your own personal information, too. Some reverse directory search sites require you to register your name, address, phone number, and/or email address to get the information you want about another party. This is one way such directories strive to expand and keep their records up to date. Of course, you don't have to give accurate information; but neither does the person you're seeking! Most recent comments on "HOWTO: Reverse Directory Searching"
Some good info here. Waaay back when I worked for a collection agency, we had address and phone number lookup directories (no cell phones back then). Very useful tools, especially for businesses. spy dialer WORKS! tried it on myself(cell & Landline) got pictures and my name. Shocking actually. Yes, some cool tools, thanks. I was surprised that I found something on Whitepages.com that I couldn't find with many Google searches. The "cool feature" with WhitePages didn't work for me though--when I entered just the street name, I got zero results, but when I added the number, I got one. I just did a reverse directory search with Whitepages.com using my 16 year old address, a house I sold 14 years ago. In addition to two strangers' names, they have me listed there as well. After contacting Whitepages, this is the response. "Thank you for contacting the Whitepages Customer Care Team, my name is Sashana. I wanted to take a moment to explain how our product works. First off, I'd like to apologize if you encountered any outdated or incorrect information. In a fast-paced world, it will be difficult to have perfect contact information all of the time, but we will always aim to do better. I'd like to explain a little bit about our listings, and then explain one of our features on Whitepages Premium that can notify you when new information is added. •	We can leave the listing visible. We do frequently update our database with new information as we source it. This means it could automatically correct itself in the future. •	We can remove the listing from the site. If that's the case, please reply back with the exact URL/web address in which your information is visible." Sixteen years and they still have old info? There's also Truepeoplesearch.com. It works pretty well!